This blog focuses primarily on West Jackson, hence it’s official name–The Emergence of West Jackson. However, this blog also highlights the work of Jackson State University’s Center for University-Based Development (CUBD). That’s why the following event, although not taking place in West Jackson, is being announced here. 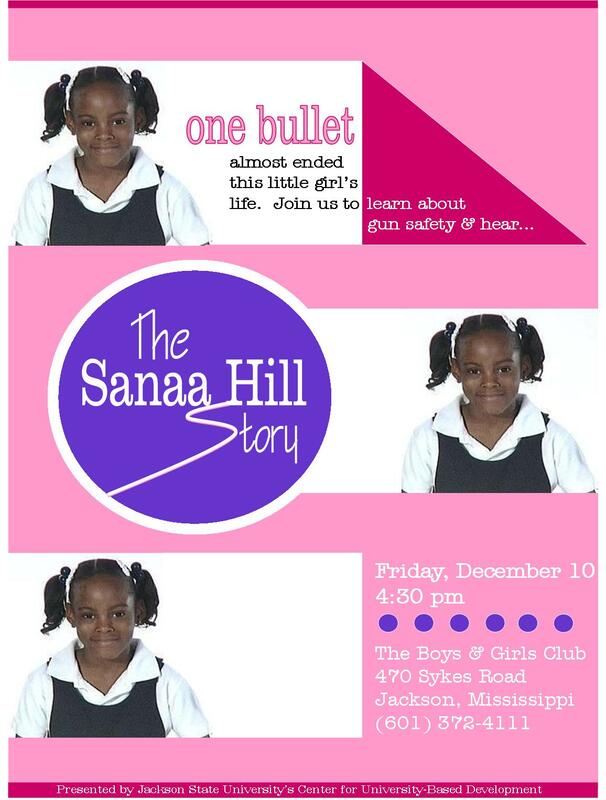 During the afternoon of December 10, 2009, Sanaa Hill was diligently working on a homework assignment at the Sykes Road Boys & Girls Club in South Jackson. That same afternoon, a stray rifle bullet penetrated the walls of the Boys & Girls Club and struck the 8-year-old girl in the head. For this to happen to this little girl was shocking and appalling, but what happened after this nightmare is nothing short of a miracle. After undergoing surgery to remove the bullet and bone fragments from her head, Sanaa was released from the hospital on December 24, 2009–just in time to spend Christmas with her family at home. The Center for University-Based Development invites you to hear Sanaa’s story as she shares her thoughts on the tragedy one year from the date on which it happened. Officers from the Jackson Police Department will also be present to offer tips on how you can assist with gun safety. This event will take place at 4:30 p.m. on Friday, December 10, at the Sykes Road Boys & Girls Club (470 Sykes Road). For more information, call 601.372.4111.